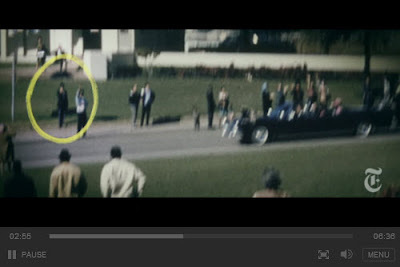 A bit late in posting this on that dreaded anniversary here in the Dallas metroplex, but see the link below for Errol Morris' short but stunning documentary about the swirling conspiracy (or lack thereof) of one of the more unusual footnotes to the JFK assassination. 1. Autumn Leaves (1958)- I'm still kicking myself after I missed TCM's airing of this late 50's drama starring Cliff Robertson last month following his death. I'm currently working my way through the films of Robert Aldrich, and this is one of the few I haven't seen. I suppose its good to know the film is in circulation now, but a hands-on DVD release would be so much nicer. 2. Four Nights Of A Dreamer (1971)- Slowly but surely, some Robert Bresson is making its way onto DVD, but there are still momentous gaps (i.e. "The Devil Probably" and a good copy of "L'Argent" now OOP). This, his first film of the 70's, sounds especially appealing as a man and woman get to know each other over the course of four nights before her lover returns. Everything I've read classifies "Four Nights Of A Dreamer" as a hugely influential film. 3. Monsignor (1982)- Ok, first off this isn't a very good film- Christopher Reeves plays a priest who breaks pretty much every vow, getting involved with the black market and defiling a nun (Genevie Bujold). Reeves carries the same half-smirk the entire film, but it is respectably helmed by director Frank Perry and the various mumblings between church and mafia loyalty make for some compelling ideas in a low-rent "Godfather" kind of way. And the scene where Reeves and Bujold lock eyes during a large mass procession is quite stirring. Plus, we always need more Frank Perry on video. 4. Quatermass and the Pit (1967)- One of those films that's been on DVD before, ran OOP, was re-released, and now appears to be available through an import Blu-ray. Whatever the status, this late 60's Hammer horror/sci-fi shouldn't be that difficult to see. 5. The Professor aka Il Cammorista (1986)- Ben Gazzara stars as a man who builds a mafia empire from his prison walls and then continues on once he's released. A real oddity here... the film debut of Italian director Giuseppe Tornatore, starring American Gazzara and running 171 minutes! I suppose it was seemingly lost in the shuffle of cheapie 70's and 80's spaghetti action flicks, but it sounds very intriguing. 6. Slither (1973)- Currently on my DVR from its TCM airing last week.... I can't wait to finally see it, plus it always gets kind words from the blogosphere. 7. Malachance (2004)- Debut film from one of the most promising South American directors, Gerardo Naranjo. I'm eagerly awaitng his latest film, Miss Bala" and absolutely love both "Drama/Mex" and "I'm Gonna Explode". His odes to Godard, lovers on the run and eclectic music including Georges Delerue have been lightning bolts of exciting cinema. 8. Lepke (1975)- With Menaham Golan directing, this mid-70's tale of a gangster's rise to power will probably be suspect, but the thought of Tony Curtis starring and my appreciation for the Corman school of mafia tales has me interested. 9. The Midnight Man (1974)- Co directed by Burt Lancaster, how can this synopsis not sound fun: "The Ex-con. The Hippie. The Senator. The Pervert. The Lesbian. The Professor. The Sheriff. The Sadist. One of them is a murderer. All of them make the most fascinating murder mystery in years." 10. Day of the Beast (1996)- From the few Alex de la Iglesia films I've seen, I'm not sure if his zippy, cut-happy efforts are really my cup of tea..... although "The Last Circus" was kinetic and furthered my deep seated fears of clowns. This film, which deals with the possible birth of the devil on Christmas in Madrid, has its cult following. Temporally, "The Big Fix" is a mess. Taking its narrative cue from the film noir genre of the 40's and transferring the self-reflexive private detective and his quest to solve a mystery to California in the 1970's is only the beginning. "The Big Fix" is really a film of the 1960's, as its ideas and eventual outcome all have to do with the radical counterculture of that time and its lingering effects on fathers and sons. I did say "The Big Fix" is a "mess", but only in the best sense of the word. 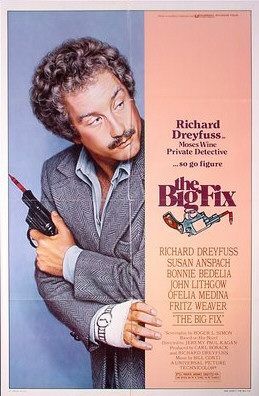 Directed by Jeremy Kagan and starring Richard Dreyfuss in an engaging and complex performance that ranks as one of his best, "The Big Fix" begins with Dreyfuss, as P.I. Moses Wine, being hired by an old flame (Susan Anspach) to work for the political campaign of a governor hopeful. Someone is trying to dereail the campaign by associating the candidate to ex-60's liberal terrorist Howard Eppis (F. Murray Abraham in a scene-stealing performance, mimcing the energetic mania of Abby Hoffman). Wine takes on the case and lesiurely floats from suspect to suspect, eventually becoming embroiled in murder, the kidnapping of a hispanic movement leader, and his own ugly child custody issues with ex-wife Bonnie Bedelia. Basically, like the best sun noirs of the 70's (i.e. "The Long Goodbye" and "Night Moves"), "The Big Fix" deals with heavy issues in a very effortless method. At first glance, one wonders when and how this thing is going to work itself out as Wine dances from the personal to the professional with little regard for either. But then, when "The Big Fix" does kick in with narrative force, it becomes a sensational piece of 70's filmmaking full of depth, surprise and unconventional noir storytelling. And just hearing Dreyfuss explain the cast on his right arm (which he actually broke in pre-production) to everyone he meets is priceless. Really kicking into the fall movie mode, with so much to see finally.... "Take Shelter", "The Skin I Live In", "J Edgar" and "Melancholia". I love this time of year. Sean Durkin’s “Martha Marcy May Marlene” stands as a strong contributor for best directorial debut of the year. Placing youngest Olsen sibling Elizabeth (now all growed up) front and center in such a psychologically penetrating effort could be distracting at first, but within the first five minutes, those fears dissipate and she turns in one of the most affecting performances of the year. Opening with her escape from a backwoods family commune into the home of estranged sister Lucy (Sarah Paulson), “Martha Marcy May Marlene” shifts back and forth in time as we understand the levels of psychological damage done to her by Patrick (John Hawkes) and her struggles to adapt to normal life. With little bearing for time or place, Durkin’s slow zoom, trance-like camera never gives the viewer a full understanding of where we are in Martha’s life until each scene progresses, likewise thrusting the viewer into the same splintered state of consciousness. It’s a bold film both compositionally and emotionally and one that’s unafraid to comb the depths of identity and family bonds. In the most angry scene, Martha’s inability to overcome her brainwashed state explodes during a prim and proper lake house party and “Martha Marcy May Marlene” becomes almost unbearable in its tension as the camera sits at a motionless distance while she’s calmed down by sister and brother-in-law. At times, it’s echoes of Ingmar Bergman-like psychological inspection are stirring, especially since the dynamic between sisters remains elusive and complex… and if that sounds like high praise then I urge one to seek out this film. And the final scene is simply terrifying in so many ways. More and more, I’ve come to realize that the magnificent promise of director Andrew Niccol’s debut film “Gattaca” (1997) is lightning in a bottle. Since then, Niccol has authored several low-key efforts that grapple with grand ideas , ultimately lost in a dumb-headed series of narrative conceits and vague emotional connectivity. Sadly, “In Time” isn’t a return to form but another example of Niccol’s inability to spin a heady concept within a thrilling narrative. Everything about “In Time” feels like a leftover direct to video cheapie from the year 2000, even down to the minimal police cars that look more like Robocop knock offs than sleek examples of modern inventiveness. The story- which takes place in a futuristic society where humans are genetically engineered to stop aging at 25 and the only true currency is minutes and hours bartered or stolen- also thuds along with zero energy. This is the type of film where everyone stands too close to the hero (Justin Timberlake) with guns, allowing him to overtake them and escape or the variation of using the word “time” in puns stands in for dialogue. And to further prove that Niccol hasn’t quite gotten over the creative spark in “Gattaca”, he apes the lush score of Michael Nyman and uses the oppositional brother overtones of that film to propel “In Time”. A real disappointment. Into the Deep End: Assayas and "Cold Water"
A natural cinematic trademark of French filmmaker Olivier Assayas is the idea of life and death in flux. His best films- "Late August, Early September", "Summer Hours" and "Clean"- all begin their emotional journey during or after the death of someone and the ensuing remnants of the living left behind. His 1994 film, "Cold Water" celebrates life for a majority of the picture, following two teenagers in love as they're separated and then re-joined... only to have life rudely interrupt their halcyon time together. Paris, 1972, a time not unnoticed for its lasting impact since the late 60's and France's youth upheaval. Christine (Virgine Ledoyen) and Gilles (Cyprien Fouquet) are troublemakers, but inseparable. 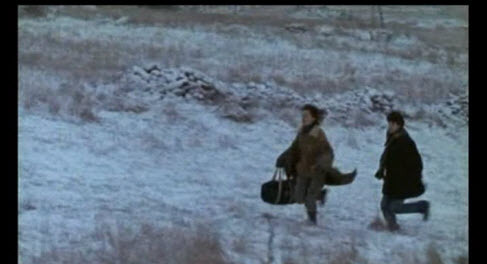 After a brief stint of shoplifting, Christine is captured but Gilles gets away. She is sent to a youth home while Gilles continues his destructive bent by purchasing sticks of dynamite and being kicked out of school. But rather than a Truffaut like coming-of-age story, Assayas delivers a much different and affecting tale of these teens. In one scene, Gilles' father tries to reach him through gentle conversation and level headed realism. "Cold Water" then shifts gears from the paternal bonding to a raucous, furious teen party in the middle of a decrepit mansion where Christine, newly escaped from her detention center, meets up with Gilles and young, impenetrable love rules again. 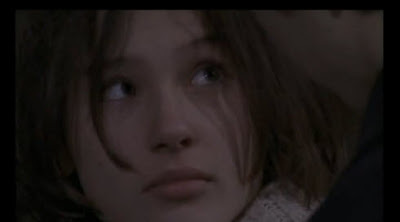 In typical Assayas fashion, a majority of "Cold Water" is filmed with a nervous handheld look that can barely hold his characters in the frame. At the party, which encompasses over a third of the film's ninety minute running time, the mood is energetic and clearly reminiscent of his own late night escapades. Music from Leonard Cohen, Janis Joplin, Nico and CCR are continually kicked off the record player with a scratch of the needle and Assayas' camera alternates between long takes that casually follows kids as they wander around the premise, take hits off a pipe or become heathens tossing furniture into a huge bonfire. After a while, the film resumes the relationship of Christine and Gilles in two very indelible moments- the first as Christine slowly roams around the house, cutting off bits of her hair with scissors.... and the second a more gentle expression as they dance together and lose themselves in each others embrace. Christine, as performed to perfection by Ledoyen, is a troubled soul and Gilles is her emotional rock, both of these sensibilities exemplified in wordless exchanges that form the core of "Cold Water". Tough times are ahead for these kids after the ebullient energy of a party such as this, but for that one night, their innocent worldview couldn't be more peaceful. Released in 1994 before Assayas would become an international sensation with "Irma Vep", I'm tempted to call "Cold Water" his best film- though I've yet to find three more of his earlier films. Ledoyen would go on to become a marginal star in the late 90's alongside Leonardo DiCaprio in the under appreciated "The Beach" and we're all aware of Assayas' cinematic legacy. "Cold water" is a tender, alive and raw example of a film that deserves a larger audience.